Perth is situated in the heart of Scotland and is easy to visit by car, train or bus. Whichever way you decide to travel to Perth, you will pass through some of the country’s most beautiful scenery. Here, surrounded by acre upon acre of woodland and countryside, you can place the outside world on the back burner. Walking around the city is a pleasure, Perth is a consistent Beautiful Britain award winner, showing a strong commitment to the environment and the city’s streets and public gardens are filled with colour from easter to autumn. Whether you are looking for a relaxing evening, corporate event or an activity packed break Murrayshall provides the perfect location whatever the occasion. 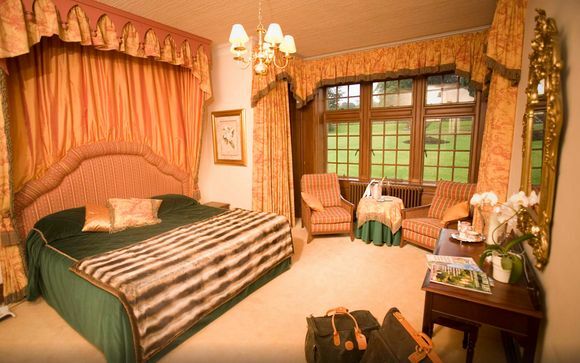 From the minute you arrive at Murrayshall House Hotel in Perthshire, you know it will be a special experience. From the welcoming smile that greets you at reception to your luxurious accommodation and fine dining restaurant, unmatched golf facilities and Stutts bar, your stay is sure to be pleasantly unique. 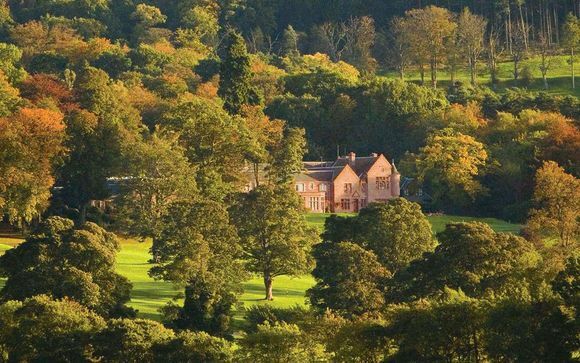 Murrayshall House has stood in its beautiful 350-acre Perthshire estate for over 300 years. The wild roe deer, red squirrel and hares still roam the grounds and falcons and owls still hover in the skies above. Handed down through a succession of aristocratic and high profile owners since first built in 1664, including Lords, Viscounts and leading businessmen, the house is as stylish, secluded and romantic as it's always been. A special place where great service combines with fun, relaxation and fine food, this is a hotel where you can play golf, explore or enjoy a romantic weekend. As with former owners who appreciate the history behind its impressive architecture and scenic estate, we feel that Murrayshall is a genuinely unique place to spend some time. All rooms are tastefully designed and well equipped, colour TV, telephone, Wi-Fi broadband Internet, tea and coffee making facilities, plus complimentary mineral water and shortbread. Every bedroom also includes a trouser press, high quality linen and a spacious well-appointed bathroom with luxury Elemis products. Just for you: £20 dinner credit per day when buying a 3-course meal. Delivering a refined dining experience in a relaxed traditional atmosphere, the award-winning Old Masters restaurant has held two AA rosettes for its cuisine consistently for the past fifteen years. A popular destination restaurant with wonderful views across the golf course, offering exciting menus to get your taste buds tingling. Service is professional yet friendly with every effort made to ensure you feel comfortable and relaxed. Throughout the year the Old Masters offers many opportunities to learn about speciality wines and foods through our gourmet evenings and regular cookery demonstrations as well as being an ever popular destination for all those special occasions. The perfect fine dining option for those who love food, and for those visiting the Murrayshall Hotel for a wedding, pre-race luncheon or special occasion, whether it be for lunch or dinner, the Old Masters restaurant provides for sixty covers in a laid back but prestigious setting that befits the character and history of Murrayshall House. The informal Stutts Bar is the ideal dining option for walkers, golfers, corporate guest and families, the flexible Club Restaurant has a relaxed and congenial atmosphere. So if you fancy a bite of lunch after the back nine or would like to sit down with the children and enjoy a family meal, the friendly service and traditional menus in the Club will make every meal an enjoyable experience. Applying the same high culinary standards as dishes served in the Old Masters restaurant, diners in The Club can expect delicious twists on traditional favourites, with locally sourced seasonal produce being incorporated in all our menus. Both courses are a real contrast to one another – Murrayshall Championship, the wider, longer course requires length and accuracy from the tee shot, this will allow golfers the opportunity to approach greens from the correct angle, widening the view of the pin. 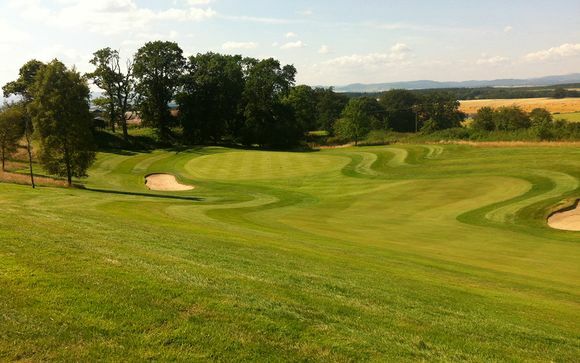 Lynedoch however, is shorter but no less a challenge, tighter fairways, bracken filled gullies and tall Scots Pine trees narrow the golfer’s view of fairways and greens.